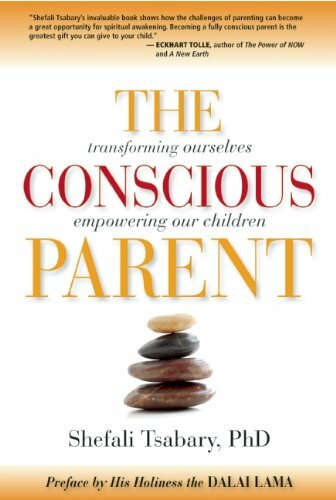 Acclaimed by Oprah and written by Shefali Tsabary, PhD, with a Preface by His Holiness the Dalai Lama, The Conscious Parent received advance acclaim from authors such as Eckhart Tolle, Marianne Wiliamson, Marci Shimoff, Laura Berman Fortgang, along with other leaders in the field of parenting. Parents unwittingly pass on their own psychological pain and emotional shallowness. To handle the dysfunctional behavior that results from this, traditional books on parenting abound with clever techniques and quick fixes. In contrast, in Dr. Tsabary’s conscious approach to parenting, children serve as mirrors of their parents’ forgotten self. The Conscious Parent recognizes a child’s potential to spark deep soul-searching, leading to a transformation of the parents. Instead of being merely the receiver of their family’s psychological and spiritual legacy, children function as a catalyst so their parents can complete the growing up that was left unfinished from their own childhood. Once parents begin learning alongside their children, power, control, and dominance become an archaic language. Instead, mutual kinship and spiritual partnership are the focus of the parent-child journey. By finding their way back to their essence, parents become able enter into true communion with their children. The parental ego crumbles as parent awaken to the ability of their children to transport them into a state of presence. Shefali Tsabary, PhD, received her doctorate in Clinical Psychology from Columbia University, New York. Born in India, she was exposed to Eastern mindfulness at an early age and integrates its teachings with Western psychology. Her ability to appeal to both a psychologically astute and consciousness-driven audience establishes her as one of a kind in the parenting field. She lectures extensively on conscious parenting around the world and is in private practice in New York. In addition to The Conscious Parent, she is also author of Out of Control—Why Discipline Doesn’t Work and What Will. Dr Tsabaary is a frequent guest on Oprah's Super Soul Sunday and Lifeclass. Sign up with your email address to receive a quarterly newsletter with updates and inspiration from Namaste Publishing.